The other strength of the state-based clinic laws, which often are based on text written by pro-life activists and lawyers and distributed to lawmakers, is that they are hard to campaign against. The zoning regulation in Virginia, for example, would require abortion clinics to widen all hallways to 5 ft. (1.5 m). "Is that the kind of thing that will rally voters?" asks Cristina Page, author of the book How the Pro-Choice Movement Saved America. "'We're not going to expand these hallways to be 5 ft. wide!' is not a compelling message. The villain is now in the fine print." When the Red River clinic opened in downtown Fargo 15 years ago, the surrounding area was a sea of blight and empty storefronts. In the years since, the area has undergone a dramatic revitalization that recently earned it a spot on a list of great neighborhoods in America. Two doors down from the clinic, customers of a deli check out using iPads. Across the street, a boutique hotel and restaurant serves upscale cocktails and locally sourced food. The beige brick building that houses the clinic looks like a vestige of a more hostile era. A glass-block wall shields those inside from view. The lock on the interior door is operated by a switch inside, and patients are buzzed in only if they have appointments. 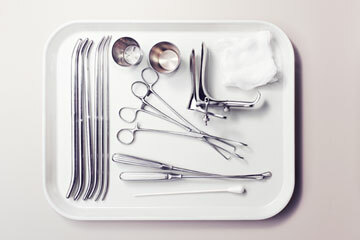 Twenty to 25 abortions are performed every week at Red River, and the procedures are usually all scheduled on a single day. On these days, a staffer inside watches a set of closed-circuit televisions monitoring the entrance and the handful of protesters from a local Catholic church who show up and mill around out front with graphic signs showing aborted fetuses. The atmosphere outside is tense, but inside, on the second floor, the waiting room is filled with sunlight. Lush houseplants are perched everywhere, and signs and posters decorate the walls: YOU ARE BEAUTIFUL. WE TRUST WOMEN. WELL-BEHAVED WOMEN RARELY MAKE HISTORY. Kromenaker, who has run Red River since it opened, was born in a small town in northern Minnesota. Her family later settled in a suburb of Minneapolis, and Kromenaker graduated from Minnesota State University at Moorhead, just a few miles from Fargo. She and her husband, a California native, have stayed put in part so she can continue her work. "We're committed to this clinic," she says. In Fargo, Kromenaker is battling the state legislature and the local pro-life community. But in Washington, establishment pro-choice activists are dealing with another set of threats that are mostly self-inflicted. What pro-choice activists call "the movement" is in many ways more fragmented than it's ever been, thanks to a widening generational divide. The problem is rooted in leadership, which is concentrated in a small but powerful army of women who were in their 20s and 30s when Roe was decided and who now oversee a number of establishment feminist organizations, including NARAL Pro-Choice America, run by Nancy Keenan, 60; the National Organization for Women, headed by Terry O'Neill, 60; and Feminist Majority, run by co-founder Eleanor Smeal, 73.